PhD in Communication (UAB), Master in Telecommunications (University Pompeu Fabra) and Bachelor of Social Communication (Universidad Central de Venezuela). He is a researcher specialized in information and communications technology (ICT), media policies, systems of indications, local communication, Information Society and development cooperation. 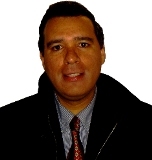 He has been the coordinator of different research projects on telecommunications networks for the International Olympic Committee (Lausanne, Switzerland) and the Consortium Localret (Barcelona, Spain) and a member of the editorial board of the Draft Organic Law of Radio and Television (Caracas, Venezuela). He has professional experience as an investigative journalist in print press and as a consultant in project management and policy deployment of broadband networks.